Here's my version--with a few modifications, of course!--of one of BYOC's newer (as of 2008) pedal designs, their Mouse vers. 2.0. I think Keith Vonderhulls really outdid himself on this freshening of the original Mouse kit design, and the new features really add a lot of tonal flexibility to an already great pedal. 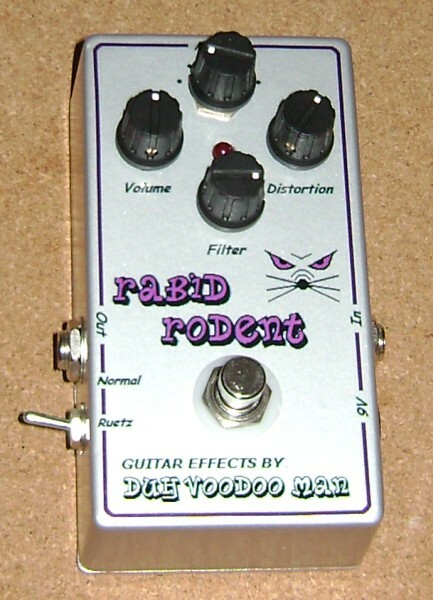 Like the older version, the new Mouse is based upon the classic ProCo Rat circuit and serves up authentic sounding 1980's vintage distortion tones. But this pedal is far from a one-trick pony, and has a variety of other distortion and overdrive sounds on tap. Expanding upon the capabilities of the original Mouse kit, the new version now offers a total of 6 distortion and overdrive modes. The three distortion flavors all use the Rat's clipping stage configuration, but vary in the components use to actually clip the signal. In addition to the stock Rat's silicon didode pair, the v.2.0 Mouse adds two more--a pair of red LED's and an asymmetric silicon diode array. 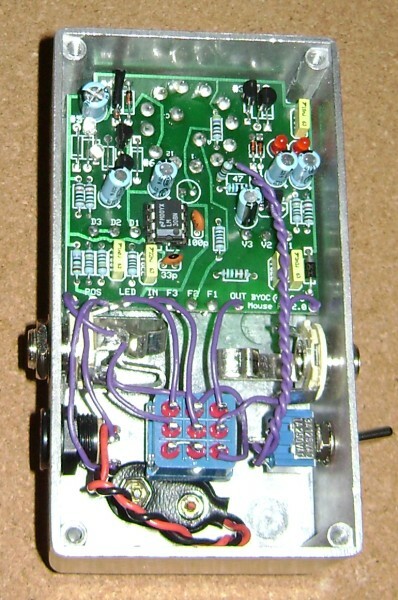 But the pedal doesn't stop there, adding a second clipping circuit in the feedback loop of the opamp, a method used in the Tube Screamer pedals and their many derivatives and imitators. Symmetric and asymmetric silicon diode arrays and a pair of MOSFETs provide the signal modification here, for a more subtle degree of distortion, a.k.a. "overdrive". This gives a total of six different distortion modes, selectable via a 6-way rotary switch. Never one to leave well enough alone though, I decided to make a few changes. First, with four of the available stock clipping modes based upon silicon diode combinations, I opted for a little more variety. So I substituted a pair of red LED's for the asymmetic silicons on the distortion circuit, and replaced the symmetric silicon diodes with a pair of J01 JFETs on the overdrive portion of the circuit. This widens the variety of tones available and gives a choice of silicon diode, LED and FET signal clipping on both sides of the 6-way switch. I also installed a switch to activate a gain reduction/EQ flattening modification called the "Ruetz mod", after the guy who invented it. This gives another whole set of six different sounds, doubling the pedals tonal capabilities. On the original build, I only had a limited amount of time to play through this pedal, because it was built for a friend/customer. But what I heard really knocked me out--such a flexible distortion pedal with an extremely broad range of tones. I liked it so much that I sold my original Mouse build (which I really loved!) and replaced it with one of these impressive little beauties! It's THAT GOOD!! Hear it for yourself in my buddy Robert Renman's rockin' video demo of the Rabid Rodent on YouTube, embedded below! Interested in owning a Rabid Rodent of your own? Then click HERE to find out how to purchase one.